First of all, I must apologize for letting my blog go fallow… pretty good use of ‘fallow’ though, right? I mean how often do you get to throw that word around? I guess playing ‘Farmville’ wasn’t a total waste of time! Anyway, I’ve been up to my elbows in projects and family time and have just not had a chance to blog lately. So… where to start… oh yeah… Stop copying files directly to the 12 hive! Seriously.. I don’t care what the file is… custom controls? java script files? images? web parts? If you are copying it to some sub folder under the 12 hive directory, then stop it! It’s bad practice, a pain to maintain, and it will bite you in the rear at some point. I don’t even like doing it on my dev VM. Isn’t this a dead horse that has been beaten beyond recognition? No.. it’s not… it’s REALLY not. There are some great tools out there to aid you and you don’t have to even open an XML file. With a couple of drag and drops you have a package ready to deploy. Stop your whining! Why do you think I created this blog? So, you’ll need to download a couple of tools. 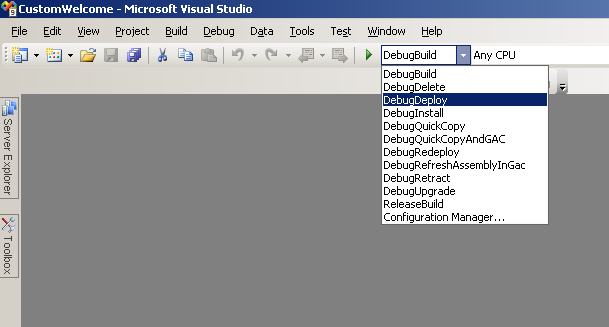 So, install Visual Studio if you haven’t (I’m using VS 2008 on my VM, so my screen shots will reflect that), then install STSDev. Let’s create a solution package! You need two more things to create a package. The location to deploy it to. Give our solution a name… hey how about “CustomWelcome”? 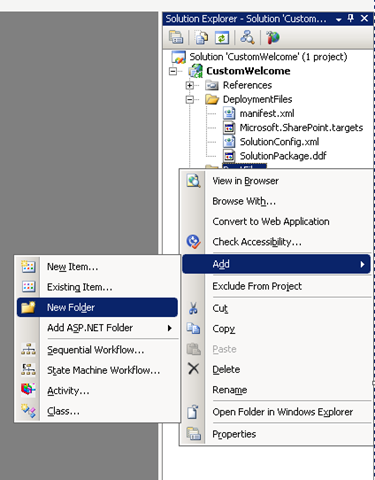 Make sure “Empty Solution” is checked and click on “Create Solution”. You will see a message saying your solution was successfully created. 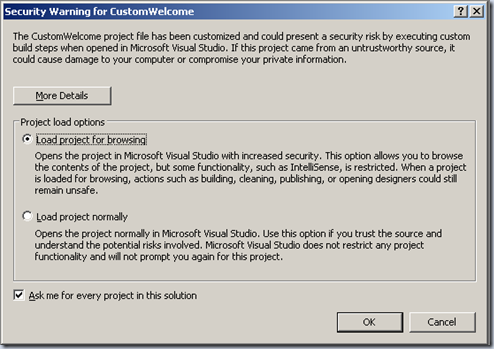 Open up that newly created solution in Visual Studio. Select “Load project normally” and click on “OK”. STSDev automatically created the folder structure and the XML files you need. It will also MODIFY these XML files for you as needed. Isn’t that cool? 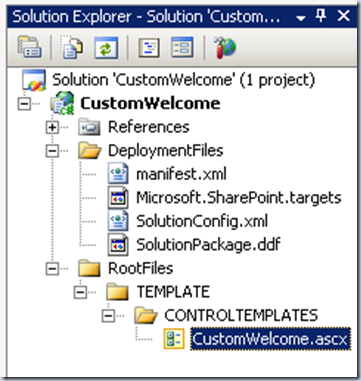 So, all you have to do to finish creating your package is to create the folder structure in the project for where our “CustomWelcome.ascx” file needs to go and put that file in the correct folder. This is also VERY easy. The “RootFiles” folder is a mirror of the 12 hive directory. Pretend “RootFiles” is the same thing as “C:\Program Files\Common Files\Microsoft Shared\web server extensions\12”. We know our file needs to be placed in “C:\Program Files\Common Files\Microsoft Shared\web server extensions\12\TEMPLATE\CONTROLTEMPLATES” so we need to replicate this structure in our Solution. This is done by adding folders. So, let’s add a folder to “RootFiles”. This is done by right clicking on “RootFiles” then “Add” then “New Folder”. Now all you have to do is drag and drop your “CustomWelcome.ascx” file onto the “CONTROLTEMPLATES” directory. Just open up the directory it’s in in explorer and drag and drop it there. You can also right click on “CONTROLTEMPLATES” and select Add->Existing Item and browse to your file. When you are done you will see your file located in the folder structure. Now… the hard part. 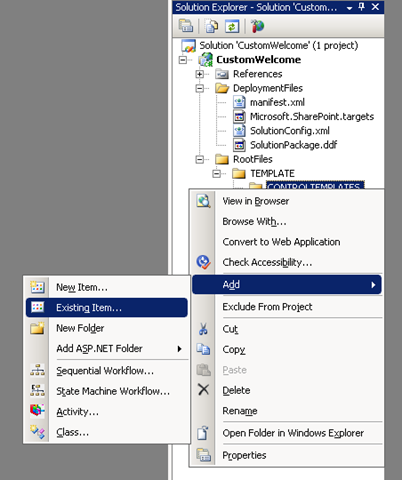 Creating the WSP file. Press F6. Now Press F6 again. The package will be built and deployed on your local VM. STSDev build script will even run the STSADM commands to deploy, redeploy, retract, etc.. for you. How’s that for a time saver? 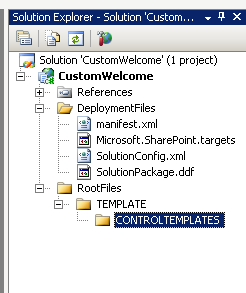 So, after the deploy is finished, go look in your local CONTROLTEMPLATES directory. The file’s there? isn’t it? Seriously, wasn’t that completely easy? If you look at your Manifest.XML file again you see that STSDev automatically modified it for you, you didn’t have to do a thing! You can add multiple files and locations in the same solution as well. Now all you have to do is take the WSP file to your other farms and deploy it using STSADM. The files go where they are supposed to and you can concentrate on other things, like getting back to Farmville.. I’ve got to harvest my strawberries. When it comes down to it, there are hundreds of “Best Practices” when it comes to SharePoint. Most people cannot agree though on what is and isn’t a Best Practice in most cases and many times the answer is “it depends”. I think this is one “Best Practice” if looked at objectively everyone can agree on. When you take into account all the benefits of creating packages it’s totally worth the few extra clicks and deployment commands. So, stop your whining.. start packaging… it just might save the planet. 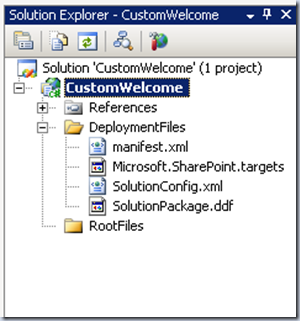 Comments on this post: Creating SharePoint Solution Packages! So easy an Admin can do it! 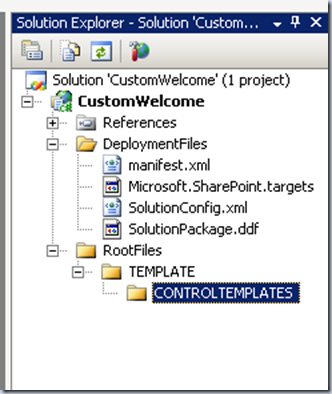 # re: Creating SharePoint Solution Packages! So easy an Admin can do it! Nice post. I don't agree this is the easiest thing to do. 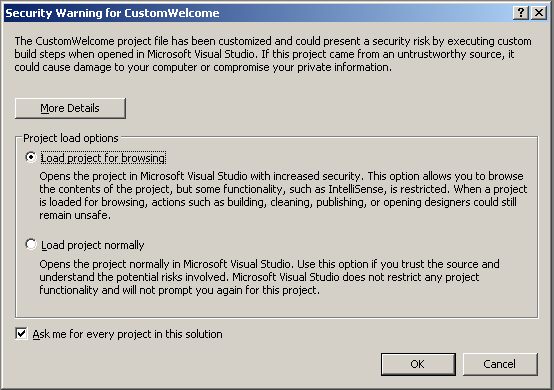 When you say "even an admin" can do it, then the next statement you're getting them to install Visual Studio. In your example you're not doing any code, just package. From an "easy for admins" to do, I would argue that you could a) download WSPBuilder.exe (command line) b) use it to create directory structure c) use notepad or any text editor to create content d) use WSPBuilder to create WSP file. I think I'lll blog this as a follow up, but a great detailed example here which is easy to follow for all. Thank You very very much for your article. no how we can add custom link options to this welcome menu?